From the Hancock County Courthouse, go on Hwy 22 east for 12.5 miles to Powelton. Turn left onto McGhee Rd (the first dirt road to the left). Go 1.5 mile to the fork (after 1.5 mile) and turn right. Go another 2.5 miles to the McGhee Home, which is on the left. 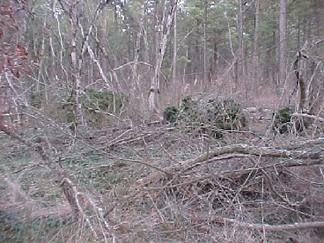 Across the road from the house is a logging road that goes to a hunting club. Go down the logging road for 0.3 mile keeping to the left when it forks. The cemetery will be on the left about 50 feet off the side of the logging road. This cemetery is technically located in Taliaferro County, as Johnson/McGhee Road is the border between Hancock and Taliaferro County along this 3-mile stretch. 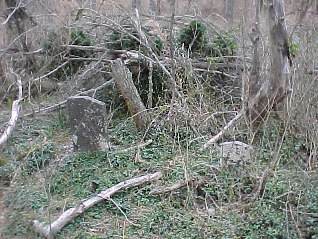 We include the cemetery here because, prior to 1830, this area was part of Hancock County and also because of the potential of the cemetery becoming a "lost" cemetery. f/o M. Johnston. "In Memory of". m/o M. Johnston. "In Memory of". d. in Hope. "In Memory of". w/o M. Johnston. m/o Albon, Amanda, and William. c/o M. and Kathy S. Johnston. d/o M. and Kathy S. Johnston. s/o M. and Kathy S. Johnston.